Friday night used to be pretty much a wasteland when it came to TV shows. People go out on Friday nights so networks used to dump their least interesting shows, or ones they didn’t care much about, at the end of the work week. Now, with pretty much everyone having a DVR and the networks needing to compete with cable and online, Friday’s TV fare has greatly improved. 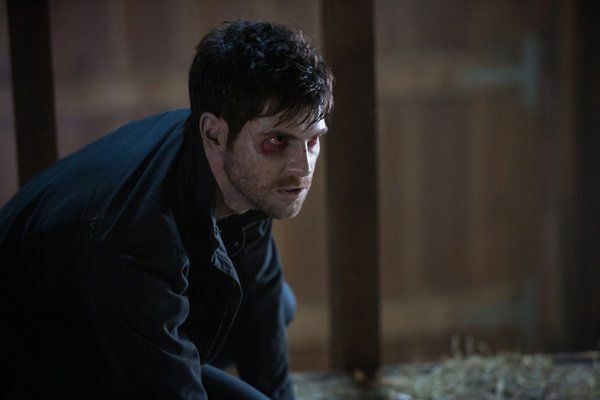 Case in point are two shows we’re big fans of: Grimm and Hannibal. Both are new tonight, now that the Olympics are over, and we’ve got previews for both of them for you. We won’t get too much into details about what happens in the new episodes, but you can definitely expect some surprises and a lot of action. 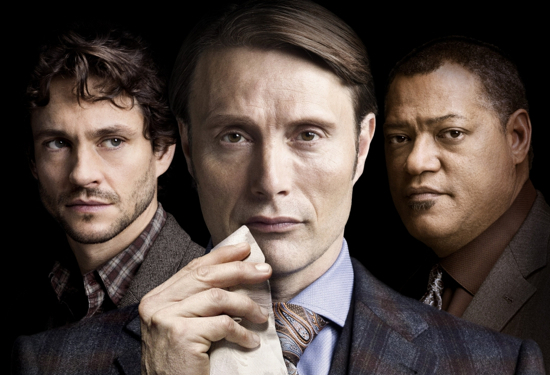 Grimm airs at 9/8C followed by Hannibal at 10/9C on NBC. Check out the previews after the break. Nick is at the doctor’s office doing the typical TV doctor’s office visit test – running on a treadmill with all kinds of wires on him. No matter how fast he runs, his heartbeat and blood pressure do not change. The doctor figures there is just an issue with the equipment. Monroe and Rosalee are out to eat, and Monroe awkwardly asks Rosalee to move in with him. They profess their love for each other, and she accepts. The chef sends over some beef and truffle tarts to the table, but Rosalee eats them both, as Monroe is apparently now a vegetarian. A couple comes over to say hi to Monroe for no apparent reason. As in all TV shows, nothing ever happens “for no reason.” Two people have died under gruesome circumstances. They climbed up into a tree and their stomachs exploded. At least one of them was a Blutbad. Nick and Hank find out that the two “victims” ate at the same restaurant. Hank and Nick talk to the chef at the restaurant who assures them he has no health violations. Nick notices that the chef and his whole cook staff are Bauerschwein, basically pig people. Nick is running crazily through the woods as Monroe and Hank are trying to track him. He sees a family coming home and chases after them. He breaks into the house and corners the father of the family. Hank and Monroe get there just in time to lure Nick out of the house. Nick chases them into a barn, and they are able to trap him inside. Captain Renard, Rosalee, and Juliette arrive as the father shows up with a gun. They manage to get the man back into his house, and head into the barn to help Nick. Captain Renard and Monroe woge, and eventually Rosalee is able to inject Nick with the antidote. They take Nick away before the cops arrive. When they get Nick back to the spice shop, they give him a second dose of the antidote. Nick is flailing around, so they handcuff him to the bed. Nick eventually wakes up, but does remember anything after fighting the Baron in the shipyard. Captain Renard receives a text from his informant saying that the job has been done. Renard checks the news online to see that his brother was killed in a car explosion in Vienna. Renard’s informant is on a train headed on vacation as instructed. Something tells me Eric is not really dead, but I guess time will tell. Captain Renard has followed his brother Eric to the shipping container warehouse, and found that Eric is taking something away in a coffin. Meanwhile, Rosalee, Monroe, and Juliette are trapped on top of a stack of shipping containers trying to fend off zombies. Captain Renard is being attacked by a pair of zombies, but woges up and takes them out. Juliette has called Hank to let him know they are in trouble and Nick is missing. Hank tries to call Nick, but Captain Renard answers. The police arrive and contain the zombies, and Captain Renard and Hank leave with Rosalee, Monroe, and Juliette. The Baron tells an unconscious Nick that he is being sent to his new castle. Hank has alerted the local cops to that there is unauthorized flight activity from the local airport. Two cops are sent to check it out, but The Baron paralyzes them both with his green goo. Hank, Captain Renard, Rosalee, Juliette, and Monroe arrive at the airport just as the plane is taking off. Renard says that they are probably taking Nick to Austria, where his family will have control of him. Eric wants Baron to show him how he “zombifies” his victims. Baron agrees, and Eric watches as one of his own men is attacked by Baron. Nick visits Juliette, and he explains to her that he wanted to tell her about his life before she went into the coma, but he was afraid. He didn’t want to push Juliette into his world. She tells him that she still loves him. Frau Pech is mixing some kind of doppelganger potion. She conspires with a waiter to use the potion to poison Adalind. Once Adalind is unconscious, Pech takes some of her blood and adds it to a vial. Pech drinks it, and Pech turns into Adalind, while Adalind turns into Pech. Stefania calls “Adalind” and tells her she has a way to kill Pech. “Adalind” rushes over to Stefania’s, and Stefania tells her how she will trick Pech and lure her away. They need Pech’s still beating heart in order to get Adalind her powers back. As Stefania is explaining to “Adalind” how they would kill Pech, Stefania’s son comes up behind “Adalind” and chokes her out with a rope. Adalind is with Eric when he takes a phone call from his father, the King. Adalind eavesdrops on the conversation, hearing Eric say that the family is in agreement. Something is going down. Stefania comes to see Adalind, telling her that there is a way to trade her healthy baby to get her powers back. Stefania makes Adalind sign a contract without reading it, saying that it is now binding. Frau Pech is seen spying on this negotiation. Adalind, worried about Pech’s warning/threat, calls Stefania to tell her what happened. Stefania says she will speak with Pech and clear everything up. Chances are Stefania will probably try and kill Frau Pech. Juliette is washing dishes in the kitchen and notices the scars from the cat scratches on her hand. She is suddenly thrown back into a memory of her and Nick in the house. He is telling her she has to go to the hospital because Adalind is a witch and she could be in danger. Monroe makes dinner plans with Nick for that evening. Nick then meets with Hank, who has just returned from his vacation. He has torn his Achilles while zip lining in Hawaii, and apparently he went with his ex wife Nadine. They hear gunshots and rush across the street. An author has been killed at a book signing, and the killer has a woman hostage upstairs. Nick chases after him, but the man jumps into the water, after turning into some kind of otter or beaver type Wesen. The author that was murdered was dating the woman, Khloe. The killer, Anton, was Khloe’s ex boyfriend. Anton was an obsessed, jealous ex boyfriend who felt that Ethan (the author) was not good enough for Khloe. Khloe tells Nick that guys fall for her very easily and have a hard time getting over her. She thanks Nick and takes his hand. She seems to have worked her charm on Nick as well. Two ranchers are driving through the fields, and one of them sees something and stops. He discovers some mutilated cattle, as well as a blue, glowing, alien man. The rancher goes for his gun, but is shoved into some fencing, impaling himself and killing him. The blue man runs away as the second rancher is coming towards them. Nick is investigated the key his aunt gave him. He shows it to Monroe, who is able to determine that it is part of a map of Germany that he has from his ancestors. The key is supposedly from a set of 7 that were used by Grimms to hide something they found in Constantinople in the 13th century during the Crusades. Nick asks Captain Renard about the keys. The Royal families have 4 of the keys, Nick has one, and the other two are unaccounted for. There are many rumors as to what is buried in the spot: the secret of alchemy, everlasting life, Mohammed’s sword, or even the nails used to put Christ on the cross (and some pieces of the cross as well). Whatever is there, it is thought to have great power, and the Royal families would do anything to get it. A woman, Jill, is on a mountain taking pictures of volcanic activity. She collects some rocks and returns to her truck, where a man comes out of the woods and accosts her. He tries to take the rocks from her, saying that she has not shown respect. She pepper sprays the man and drives off. 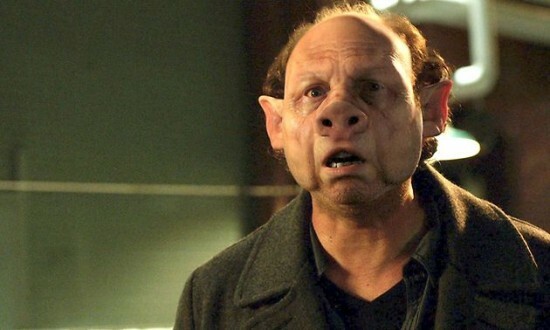 The man shows his Wesen form, some sort of horned beast. Hank is going on vacation for 3 weeks. I guess this means we’ll see more of Sgt. Wu. Or in the case of this episode, Captain Renard. Juliette arrives home and starts seeing Nicks everywhere again. This time they are in full, human form. They are all saying different things to her, and she leaves the house freaking out. She gets in the car and drives away, but “Nick” is in the car too. She swats at him and swerves out of control, crashing her car. A man is on trial for the murder of his wife, which his own maid witnessed. His defense lawyer, however, has some kind of magic dust that he uses to sway the jury and witnesses to his side. As it turns out, Rosalee is on this jury. Nick tells Monroe to take Juliette to the trailer, as it’s better for her and her recovery if Nick isn’t there if she remembers anything (or everything). Monroe shows Juliette the trailer, and she is flooded with images of several different Nicks all talking to her at once. It seems as if a bunch of memories are coming back to her all at once, in hologram or ghost form. Nick receives a coded email from his mother. She says that she plans to spend the money wisely. Monroe equates it to the coins. I guess this means the coins are safe?